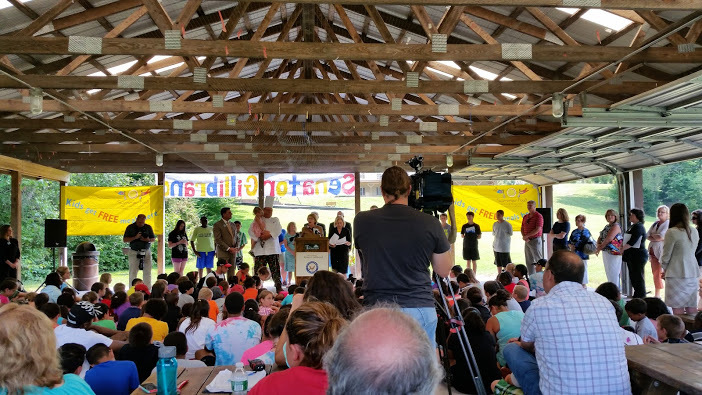 United State Senator Kirsten Gillibrand (D-NY-020) visiting YMCA Camp Thompson in Norwich, NY! Recently, YMCA of the USA (Y-USA) Government Relations and Policy held a webinar on how Ys can engage and foster relationships with their congressional representatives, state lawmakers and other public officials in an impactful manner. Data presented in the webinar underscores the importance of these visits when it comes to building relationships with congressional members and influencing their decisions. Listen to the webinar to learn more and review the toolkit for event ideas, talking points, step-by step guidance for inviting and hosting an elected official at your Y, campaign year DOs and DON’Ts, template invites and media materials and more. Moreover, the summertime is the perfect opportunity to invite public officials to your YMCA because of all the wonderful work and services delivered through the Ys summer camp programs. There is an energy and excitement shared when lawmakers get to see firsthand, all that the YMCAs in their districts do for their communities! Don’t forget to share photos from your events on social media by tagging the Alliance @nysymcas and using #YAdvocate! Y-USA will select a Grand Prize winner, who will receive complementary registration and hotel for National Advocacy Days in 2019, and two runners up will receive complementary registration for National Advocacy Days.